For over 30 generations this picturesque church has been central in the lives of the people of Capel. paintings, St Thomas a Becket church remains a consecrated building and provides a peaceful haven for residents and visitors alike. • Keep it welcoming and open to visitors. • Organise occasional events and services. Without support, the future of the church may be insecure. As an historic monument it could be kept locked and mothballed. The Friends help keep it alive and loved. A further role of the Friends is to provide a pool of volunteers to assist the Trust’s official keyholder to care for the church and its contents. 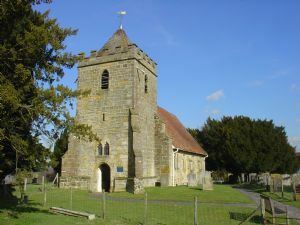 By joining The Friends of Capel Church you can make a difference by assisting the Trust to ensure that this lovely building remains open for the enjoyment of all. Membership, at a suggested amount of £5 per person per annum (minimum £1 per annum), is open to all and will show your commitment to the church and your acknowledgement of its pivotal role in the community. All members are entitled to vote at the Annual General Meeting. Newsletters with information of occasional events and Friends’ projects will appear in the parish magazine, and on the Friends of Capel Church Facebook page. Join the Friends of Capel Church.